Philadelphia Flyers defenseman Andrew MacDonald and Pittsburgh Penguins left wing Carl Hagelin battle for the puck. VORHEES, N.J. — Back when they wore Carolina blue, the Pittsburgh Penguins used to be considered the joke across the state. Flyers’ backup goalie Bobby Taylor would always be in the net against the hapless Pens to give Bernie Parent a break. The Flyers would routinely pound Pittsburgh, until something happened in the mid-1980s: Mario Lemieux arrived and the fortunes of two NHL franchises reversed. Since then, the Penguins have become the premier franchise not only in Pennsylvania but in the NHL. Since Lemieux’s arrival, followed by another superstar, Sidney Crosby, Pittsburgh has more than doubled the amount of Stanley Cups the Flyers have won, winning five to the Flyers’ zero in the last 30 years — including consecutive cups in 2016 and ’17. The first team standing in the way of a Penguins’ threepeat is the Flyers. This is what Flyers’ fans crave — and they got it, a first-round, best-of-seven playoff series against the two-time defending Stanley Cup champions. Could the Flyers stop the Penguins’ reign? But this series should have more of a happy-to-be-in-the-playoffs feel for a Flyers team not expected to do anything significant, especially against a Pens team the Flyers haven’t beaten in over a year. Call this playoff trip a nice first step to bigger things ahead. The Penguins are an aging team riding on fumes, having played more games the last two years than any team in the NHL. Crosby, Phil Kessel, Kris Letang, Evgeni Malkin and Patric Hornqvist are all 30 or older. This is a team on its last mission, before some of that nucleus splinters off. Obviously it’s something, however, the Flyers don’t want to hear. Patrick will play one of the more pivotal roles in the series, possibly matched up against Malkin. Patrick has scored 10 of his 13 goals this season since Jan. 31. The reality is Pittsburgh is faster, deeper and has a team from top-to-bottom full of playoff experience. The Penguins also possess the most potent power play in the NHL, converting a league-high 26% of their opportunities (68 of 260 chances) in comparison to the Flyers, who were ranked No. 16 in the NHL converting 20% (54 of 261 chances). “The Penguins are a great team, they won back-to-back cups, and they have a lot of experience and good players who can make plays,” Flyers’ defenseman Radko Gudas said. “Stopping their power play would be huge. I know it’s something hard to do, but when we’re out there, we have to make sure we communicate with each other. 14. Flyers: 236 GA, 2.88 avg. 20. Penguins: 248 GA, 3.02 avg. “We have to block shots and make sure we’re all in the same page. But that might not even matter. The Penguins don’t have anything they can hide from us. We know what they’re going to do — and they’re still going to do and be successful at it. What system we’ll see is tough to say, because they move around a lot. Sidney is all over the net, and their variation of things that they do makes them dangerous. Claude Giroux is the hottest player in hockey now. His 102 points, 34 goals and 68 assists are all career highs, and he carries a 10-game point streak heading into the postseason. Giroux is one of six current players (with Jake Voracek, Sean Couturier, Wayne Simmonds, Matt Read and Brandon Manning) who were on the last Flyers team that won a playoff series, when the Flyers beat the Penguins in six. 0-1-1, 5.31 GAA, .864 save pct. 1-0, 2.93 GAA, .923 save pct. “I think Pittsburgh has one of the deepest teams in the league,” Giroux said. “They have four lines that can play against anyone. They have all of the pieces on paper. Their power play won them a lot of games this year, we’re aware of that. They move the puck well and they have a lot of key players on the power play. Flyers’ coach Dave Hakstol knows the reality. 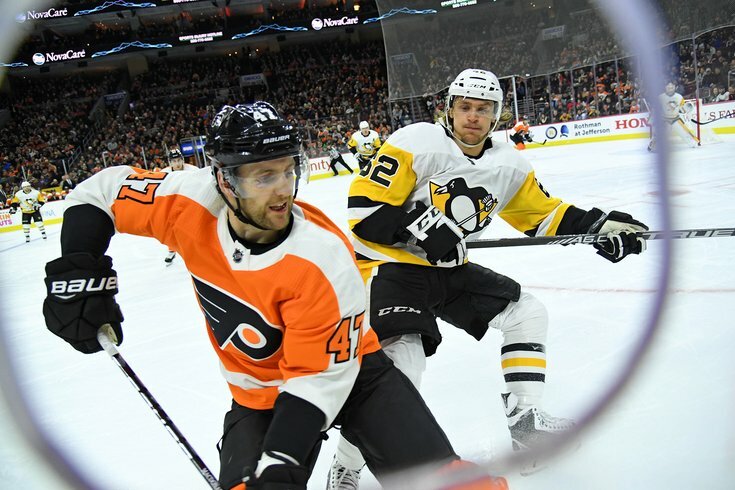 What likely will happen throughout the series is the Flyers will be chasing the speedy, explosive Penguins around the ice and, regrettably, be whistled for penalties trying to keep up. The Flyers were the third-least penalized team in the NHL. But they weren’t facing the defending Stanley Cup champions every night. Giroux and Travis Konecny could be the only two Flyers with the speed to stay with the Penguins. From there, it is a series that could get ugly. Pittsburgh has scored five goals in each of its four regular-season wins against the Flyers, who were outscored 20-11 overall and outscored 5-2 on the power play. The portents say it lasts five games. Speed, speed, speed. The Penguins have it in abundance, compared to the Flyers. Pittsburgh outscored the Flyers 20-11 during the four regular-season games and the best-of-seven playoff series won’t change anything. In my opinion, this series will only do more to show the difference between a Stanley Cup contender and a young team still looking for an identity. I can see the Flyers doing a lot of chasing throughout this series, and consequently, getting hit with myriad penalties. The Penguins have the best power play in hockey — too formidable for the Flyers to stop. This was a nice step-up year for the Flyers. They’re definitely a team on the rise, while the Penguins are a team on its last legs on a mission toward a threepeat (That won’t happen. They’ll get stopped by Boston).